Should You Still Buy The Second Generation Moto G? Motorola started the budget smartphone segment from scratch with the first Moto G. India got excited, because never before was there a handset that included a great processor, great build quality and more importantly, one that sold at a low price tag. Motorola wrote it off as a success and was geared up to sell the second generation Moto G until Xiaomi showed up with a massive selection of budget devices, that came with better specifications. Clearly, what Xiaomi does lack is after sales service. A sore spot for an otherwise pretty-much trustworthy brand. So it makes sense that Motorola’s service network makes more sense if this is what you are looking for. The Moto G (2nd Gen) was a great device, and it still is. It was a smartphone that broke the chains for the budget segment by delivering a budget smartphone that users were looking for. One that comes with balanced specs, reliable hardware and software, a decent camera, with dual SIM slots and expandable memory (that was not present in its predecessor). The Moto G (2nd generation) alongside the Moto E.
So should you buy the Moto G (2nd gen) right now? Especially when the rumours about the handset are so hot and the launch is just a week away? Firstly, the new Moto G’s leaked hardware specifications are out. So in terms of hardware you are not missing out on much; unless you are looking to upgrade to a better Moto G with the rumoured 2 GB RAM version. Secondly, the upcoming Moto G is expected to be splash proof. This makes sense, but not much, since you will not be able to sink your phone in water or even use it in water (for that matter). So again, it is not exactly a deal breaker. 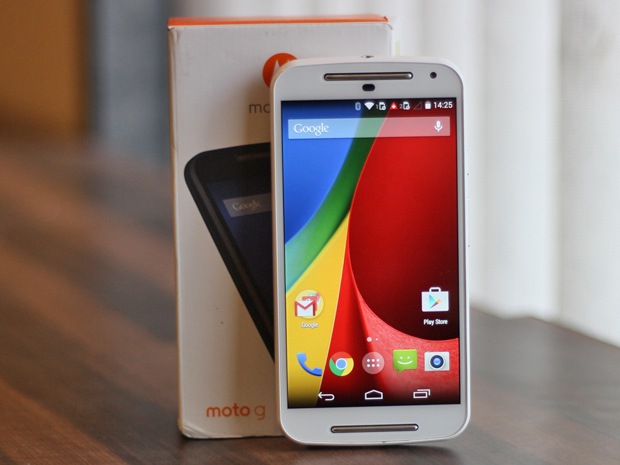 Thirdly, the currently available Moto G has already received its share of price cuts. The handset was launched at Rs 12,999, which then dropped to Rs 10,999 and has now settled at Rs 9999. The new handset will obviously be launched at around Rs 13,000 price bracket, so if you are looking for a quality budget smartphone, it is available at the right price, for now. In short, if you have the need for a quality budget smartphone at a reasonable price tag, you can go in for the Motorola Moto G (2nd gen). The price drop is expected to take place gradually, but we have a good feeling that Motorola may cull the old smartphone immediately thanks to the specs that are so similar. More so, the rumours about Motorola launching two smartphones (one with 1 GB or RAM and the other with 2) are rampant, so this again proves our point that old Moto will be no more.